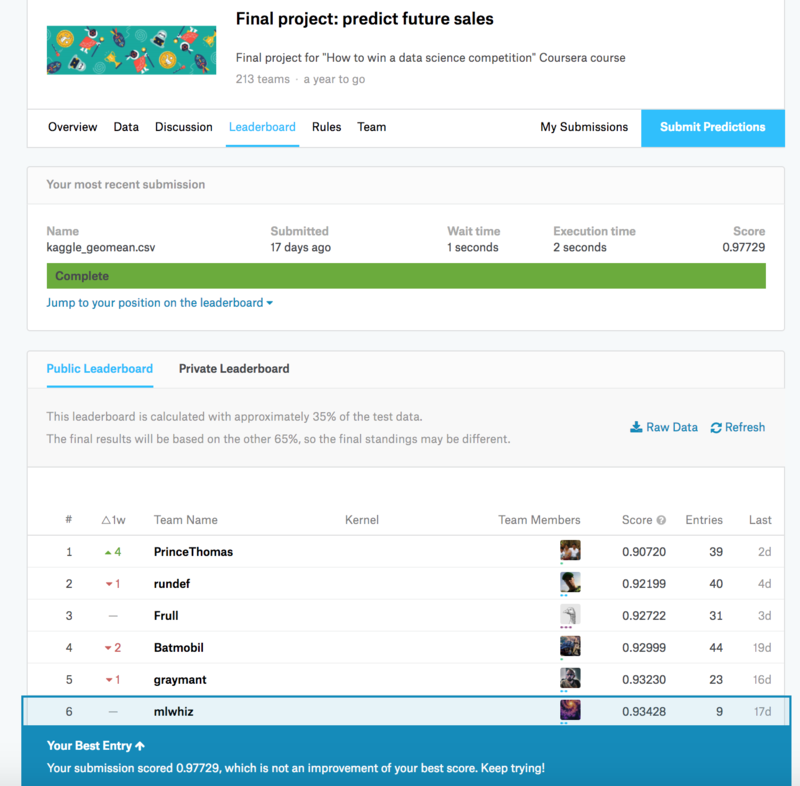 Recently Kaggle master Kazanova along with some of his friends released a "How to win a data science competition" Coursera course. The Course involved a final project which itself was a time series prediction problem. Here I will describe how I got a top 10 position as of writing this article. In this competition, we were given a challenging time-series dataset consisting of daily sales data, kindly provided by one of the largest Russian software firms - 1C Company. We were asked you to predict total sales for every product and store in the next month. The evaluation metric was RMSE where True target values are clipped into [0,20] range. This target range will be a lot important in understanding the submissions that I will prepare. The main thing that I noticed was that the data preparation aspect of this competition was by far the most important thing. I created a variety of features. Here are the steps I took and the features I created. This is important because in the months we don't have data for an item store combination, the machine learning algorithm needs to be specifically told that the sales is zero. In the start, I told that the clipping aspect of [0,20] will be important. In the next few lines, I clipped the days to range[0,40]. You might ask me why 40. An intuitive answer is if I had clipped to range [0,20] there would be very few tree nodes that could give 20 as an answer. While if I increase it to 40 having a 20 becomes much more easier. Please note that We will clip our predictions in the [0,20] range in the end. Used top 10 models from tuned XGBoosts to generate predictions. Final solution was the average of these 10 predictions. Learned a lot of new things from this awesome course. Most recommended.